Patented dual windows are available to fit all flat glass type sight flow indicators and sightwindows. The glass is encased in a metal cartridge. Compressive forces caused by bolting are spread evenly over the glass surface, reducing stress concentrations. 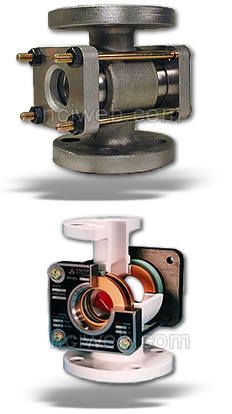 The forces are largely taken by the cartridge rather than the glass, and gasket sealing is improved with higher unit load per area with lower bolting forces. With two glass discs separated by an air space, the effects of thermal shock are reduced by 60%. Should either the inner or outer glass break due to erosion, corrosion, or mechanical forces, the remaining window will sustain the pressure. If, for any reason the inside glass should fail, the inside glass should fail, the outside glass will hold until the unit can be taken down and repaired. Care must by taken at time of window replacement. Be certain to follow all instructions in "Storage, Installation, Operation, Maintenance and Service of Jacoby Tarbox Sight Flow Indicators and Sight Windows." Wherever there is need for extra precaution, it is both simple and economical to replace single glasses with dual windows by using longer bolts. External mechanical impact - if the outer glass is cracked or shattered, the inner glass can temporarily continue in service until the unit can be repaired or replaced. Abnormal compressive forces - in maintenance or replacement situations, the housing assists in alignment of the glass and can absorb uneven or excessive compression. Thermal shock - in high temperature applications the inner and outer glass protect one another from an extreme thermal gradient. The air pocket between the glass provides an insulative effect. Corrosion/erosion - if the inner glass is weakened and it breaks, the outer glass can temporarily contain the fluid, withstand the pressure, and continue in service until the unit can be repaired or replaced.